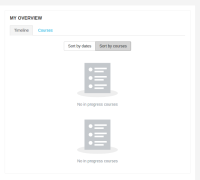 The sort-by-courses page in the timeline view currently shows all of the in-progress courses that the user is enrolled in which results in a big request to the server to get all of the events for each of those courses. Instead we should only show the first 6 courses (consistent with the courses tab) and then show a "More courses" button at the bottom of the list to load the next 6 courses. When that button is clicked it should send a single request to the server to get the events for the next 6 courses and then render the result at the bottom of the list.